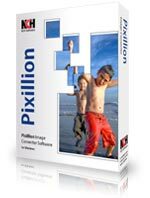 Pixillion Image Converter Plus Edition Software - Convert JPEG, GIF, BMP etc. Boasts powerful features including batch conversion, advanced image resizing, and conversion to PDF. Pixillion also lets you convert images directly from the right click menu. .png, .gif, .jpg, .jpeg, .bmp, .jp2, .psd, .tga, .pcx, .tif, .tiff, .wbmp, .ras, .pgf, .ppm, .dng, .raf, .crw, .cr2, .kdc, .dcr, .mrw, .nef, .orf, .ptx, .pef, .arw, .srf, .x3f, .erf, .mef, .mos, .raw, .r3d. Batch converts thousands of files at once. 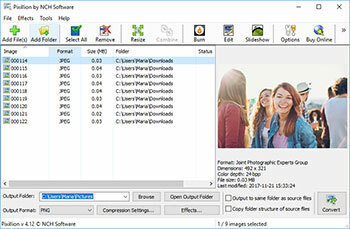 Adjust the quality of your jpeg and pdf files. Use your right click menu to convert from outside the program. Add text captions to your images. Convert your PDF to A4, Letter or Legal size. Load images directly from a CD, Windows folder or drag and drop them straight into the program. Integrate with Express Burn Disc Burning Software to save your photos and images to CD or DVD. Create your own command line automation. Combine with PhotoStage Slideshow creator to produce slideshows. Edit with PhotoPad Picture Editor to crop, resize, add effects and more.